In business, change sometimes happens more quickly than you want it to – transformative technologies arrive suddenly and economies shift. Telling your staff to embrace change and get creative is all well and good, but that will not address their (or your) underlying anxieties. The reality is that change is usually a threat – one that has the potential to bring your business to a halt. Given Virgin’s long experience in the music industry, I often receive questions from readers about the industry’s future. How can anyone successfully launch a business in this sector when transformative change is stressing even the nimblest players? Our experience shows there is always opportunity in times of change. The pundits who have predicted the end of the industry should remember the last time it was in meltdown: 1982. The economic recession was having a deep impact. Many people were home-taping off the radio or from a friend’s LP – a forerunner to illegal downloading. At the time, Virgin Retail had over 100 record stores across the U.K. On weekdays they were deserted. Then we learned that the CD was about to take the market by storm. At first the only way for us to survive was to start clearing the decks for the new stocks and discounting our LPs. We succeeded in switching our business over to CDs, which not all competitors did. We could also see the dawn of another retailing phenomenon. Two years after the introduction of the personal computer in 1980, there were already nearly 500,000 video-game machines in use in the U.K. Soon, selling games and then films became a worthwhile sideline for our stores. By 1986, even Virgin Megastores was under threat. Our biggest rival, HMV, was going after us by opening giant stores, some near our flagship locations. Undeterred, we launched our Dublin store, then the biggest in the world, at Aston’s Quay. That store not only stocked specialist classical and jazz, folk and rock music, but also sold music videos, games and computer software. This was where I could see the future of our business. And we gave the old-fashioned retailers, such as Woolworths, Dixons and Currys, a run for their money. Our shop windows and store interiors were dynamic and exciting. We brought in bands to perform and play a few songs. These events brought more sales and better publicity. So, despite — and because of –the disruptive change that had just taken place, we transformed our business model and did very well in the ’80s and ’90s. Did all this work make us future-proof? Of course not. Even from the start, our smaller Virgin Records shops made little money. The stores kept our youthful, irreverent brand in the public eye, but they were unsustainable in the long run. One of my biggest business mistakes – indeed, regrets – was not selling all of our stores sooner. Closing the book on Virgin Records in 1992, with the sale to EMI, was painful, but the best decision. Today, is digital downloading killing music? The economics of music production are far healthier now than they ever were in Virgin’s heyday as a music company. When we built our recording studio, it was a massive, expensive undertaking. Virgin Records’ job was to bankroll recording sessions for musicians – and take the risks. To make money, we had to sell a lot of albums. Now a top-quality album can be made on a laptop, and then you can send the file over the Internet to anyone, almost anywhere. Promotion is as easy as setting up a page on MySpace, Facebook or another social networking site. Economies of scale don’t matter anymore to young musicians, although they still matter a great deal to the record companies and their shareholders. I do think that record companies will survive, but they will have to be much leaner – and in business, small is beautiful. Those smaller companies will have to discover genuine talent, which is the reason many people who are passionate about music choose careers in the industry. And with all that energy and zeal, there’s no telling what some entrepreneurs will achieve next. This is an edited excerpt from Richard Branson‘s book Business Stripped Bare: Adventures of a Global Entrepreneur (Virgin Books, 2010). 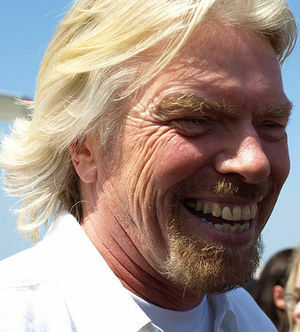 This entry was posted in strategy and tagged Business, Business Stripped Bare: Adventures of a Global Entrepreneur, Myspace, Richard Branson, Virgin Atlantic Airways, Virgin Books, Virgin Megastores, Virgin Records by dimitri seneca snowden. Bookmark the permalink.